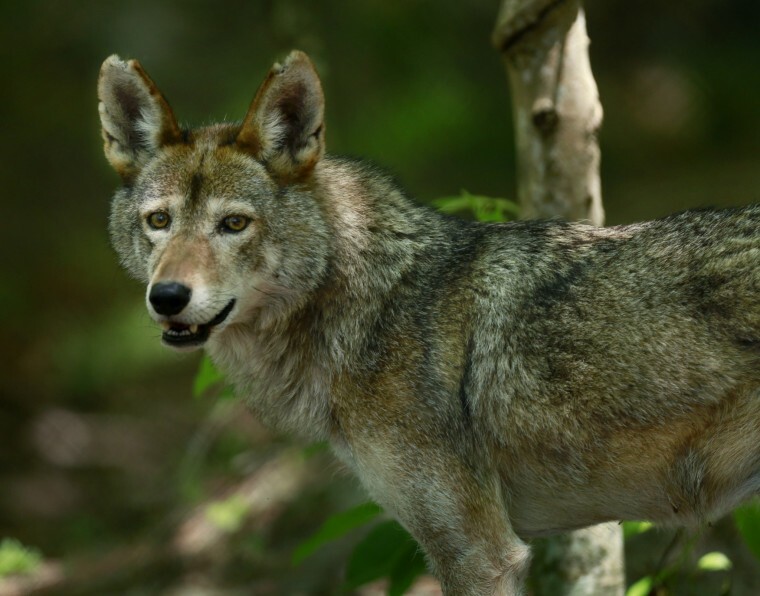 In the 27 years since federal officials reintroduced the red wolf in the wild, a restoration program has mustered about 100 of the carnivores in a handful of North Carolina counties. A decision looms in early 2015 on whether to continue efforts to maintain the only wild population of the species. How the species’ existence will play out, in the wild or in a cage, has been debated in courtrooms, at high levels of the federal government and in 48,000 public comments to the U.S. Fish and Wildlife Service. The importance of the decision is reflected in the deliberate pace the agency is taking. Tom MacKenzie, a spokesman for the wildlife service, said that the decision on the program’s fate is expected in the first three months of the year but that he couldn’t be more specific. “They’re trying to get it done early as possible, but in a deliberative process that allows for everyone’s opinions to be brought in,” he said. Once common in the Southeast, the red wolf had been considered extinct in the wild as of 1980 because of factors including hunting and loss of habitat. In 1987, wildlife officials released red wolves bred in captivity back into the wild in North Carolina. About 100 of them now roam five eastern North Carolina counties, and about 200 are in captive breeding programs. As part of their evaluation, federal officials commissioned an independent review in late 2014 that found flaws in how the program is run, ranging from inadequate understanding of population trends to poor coordination with local managers. The report also suggested that red wolves be reintroduced in additional areas. The federal agency has said all options are on the table. When a program to restore the wolves to the Smoky Mountains in the western part of the state ended in 1998, the agency tried to capture all of the animals and bring them back to captivity, Leopoldo Miranda, an assistant regional director for the Fish and Wildlife Service, has said. MacKenzie said Miranda and other decision-makers were unavailable for an interview. In November, conservation groups won a court battle to impose stricter hunting rules for coyotes in five eastern North Carolina counties — including a ban on nighttime hunting — that are meant to protect the wolves, which look similar. The groups cited gunshots as a leading cause of death for the wolves, even though it’s illegal to kill them in most circumstances. The settlement agreement does allow for daytime hunting on private land by permit. A lawyer for the Animal Welfare Institute, Tara Zuardo, said she hopes that allowing daytime hunting will placate landowners and reduce political pressure that wildlife officials may be feeling. All coyote hunting had been banned for several months before the settlement was struck. Zuardo said she’s hopeful that federal wildlife officials will decide to continue or modify the red wolf program — and perhaps release them in additional sites — rather than pull the plug. This video is called Clouded leopard (Neofelis nebulosa). The Formosan clouded leopard was hunted to extinction in Taiwan in the 1980s, but it might get a new start on the island in the future, according to Scientific American. Two years ago, after a 13 year search, scientists concluded that the leopard (Neofelis nebulosa brachyura) had gone extinct in Taiwan. But a new paper by the same scientists states the island’s ecology has improved so much since the leopards disappeared that they might once again thrive there. Clouded leopards disappeared from Taiwan decades ago, probably in the 1980s after intense overhunting for their furs followed by destruction of their forest habitat and declining populations of the cats’ prey species. Orca whale by Getty Images. PETA Asia’s exposé of angora farms in China – where rabbits have the fur violently ripped out of their skin – has led retailers, including ASOS, H&M, Calvin Klein, Ted Baker, French Connection, All Saints, Tommy Hilfiger and many more, to drop this cruel product in droves – you’d be hard-pressed to find a single shop on the High Street still offering angora. In the past month alone, we’ve added Lacoste and Monsoon to the list. Twenty years after Tyke the elephant was mowed down in a hail of gunfire after she killed her trainer and went on a rampage following years of confinement and abuse, the Moscow International Circus has pledged not to use any animals in its upcoming performances. Also this year, Mexico City joined Bolivia, Colombia, Paraguay and Peru in banning circuses that use wild animals. Shamefully, we’re still waiting for the government to deliver on its promise to make these archaic spectacles illegal here in the UK. Following a ban on cosmetics experiments on animals last year, the Indian government announced a ban on the importation of cosmetics tested on animals elsewhere. This news brings India into line with the European Union and Israel and will spare millions of animals being blinded, poisoned and killed in cruel and useless experiments. The Canadian government’s attempt to force the cruel products of its despised commercial seal slaughter onto the unwilling EU public was stopped once and for all when the World Trade Organisation (WTO) rejected its appeal earlier this year. The WTO’s decision is a victory for baby seals, who for years have been bludgeoned to death by the thousands in front of other terrorised seals, and brings us a giant step closer to a day when violence on Canadian ice floes is a thing of the past. After three years of campaigning by PETA and our international affiliates, China Southern Airlines announced a ban on shipments of primates to laboratories, where they were poisoned, crippled and mutilated in cruel experiments. Air France is now the only major airline still still giving primates a one-way ticket to experimentation and death. Sant Joan in Mallorca joined towns such as Tossa de Mar and the entire region of Catalonia in banning bullfights – a sign of the growing Spanish resistance to this cruel and archaic pastime. Towns are now finding innovative new ways to celebrate traditional festivals without harming animals – in Mataelpino in central Spain, for example, the Running of the Balls was introduced as a humane alternative to the traditional but horrific Running of the Bulls. In a groundbreaking victory more than three decades in the making, the US military agreed to replace the use of animals in six different areas of medical training with modern human-patient simulators that better prepare medical personnel to treat injured soldiers and spare animals being cut up and having hard plastic tubes repeatedly forced down their throats, among other invasive and often deadly procedures. Unfortunately, the UK and a handful of other EU countries still shoot and then stitch up live pigs in inhumane exercises. For three decades, Mimi and Dolly were confined to this filthy and mouldy shack. PETA Germany went public about their plight, and more than 21,000 people responded to its call to action. Driven by the public’s outrage, the authorities put pressure on the chimpanzees’ “owner” to relinquish custody of the animals, and within weeks Mimi and Dolly were transferred to a Dutch wildlife sanctuary. Anyone who cares about marine life and wants orcas and dolphins to live free in the oceans with their pods is cheering the year that SeaWorld has had following the release of the BAFTA-nominated documentary Blackfish. Attendance at its parks is down, musicians scheduled to perform have jumped ship and the world’s largest student travel company, STA Travel, pulled SeaWorld promotions from its website. Millions of concerned people followed this young elephant’s story with bated breath. 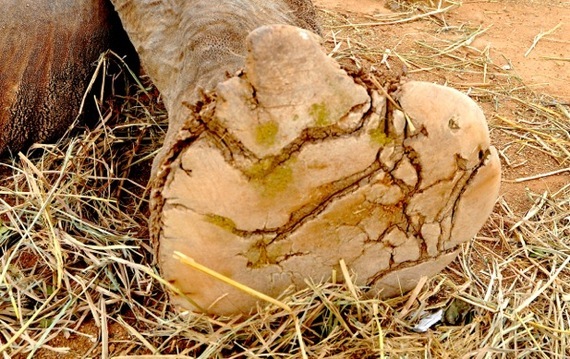 Sunder endured years of abuse at the Indian temple where he was held prisoner. 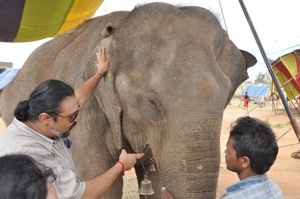 Thanks to the determined efforts of PETA India and actions from compassionate supporters around the world, Sunder was finally freed and moved to his new home, a nearly 50-hectare forested elephant-care centre at Bannerghatta Biological Park, where he has been able to explore and make friends with other elephants for the very first time. Change doesn’t always come quickly. More than 60 billion cows, chickens, pigs and other animals are killed for their flesh every year around the world; animals of many different species are still being tortured and killed for their skin and fur; millions of animals are used in laboratory experiments; and there are still millions of captive animals languishing in zoos, aquaria and circuses. But as the above 10 victories demonstrate, times and attitudes are changing. WTO rules in India’s favour in steel dispute with U.S.
By and large, Indonesia is a peaceful country. In fact, on the United Nations Office of Drugs and Crime’s list of homicide rates, Indonesia ranks number 10, making Indonesians one of the least murderous people on Earth. A ban on gun ownership probably helps, although obviously there are many other ways to snuff out another person. Maybe Indonesia’s general tendency to avoid conflict helps, too. Whatever the reason why Indonesians are relatively unlikely to kill each other, such favors are not extended to Indonesia’s non-human wildlife. The relative safety of Indonesia’s people does not guarantee similar security for its animals. 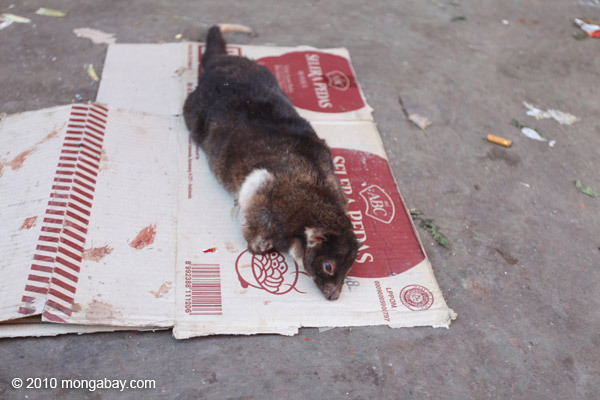 Wildlife killing in Indonesia seems to be at an all-time high. In fact, a recent study published in the respected journal Conservation Biology indicates that on the island of Borneo, wildlife killing is now a bigger conservation threat than commercial logging. Now such a statement is bound to generate a lot of derision. Many conservation organizations, scientists, as well as the government authorities will pooh-pooh the idea that hunting impacts are that disastrous. Why that is, I want to explore further. But first, back to the study. The research, led by Jedediah Brodie of the University of British Columbia, deployed a series of camera traps across a gradient of disturbed areas to investigate direct and indirect impacts on wildlife. 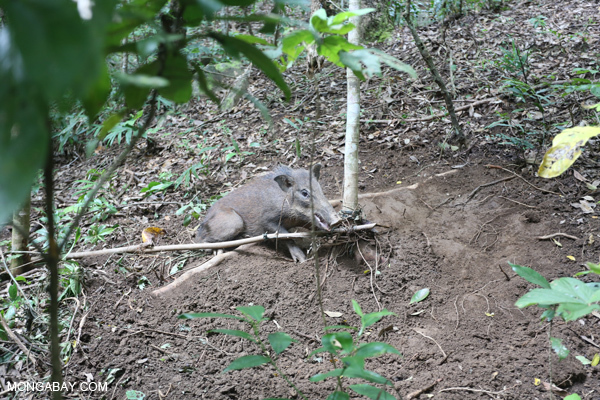 Although both hunting and new logging reduced the number of species in a given area, there was evidence that some wildlife eventually returned to selectively logged areas. This confirms analyses that my colleagues and I published in the Life after Logging book, several years ago. The important finding is that the impacts of logging were relatively transient. Hunting pressure on the other hand was continual. Overall, hunting adversely impacted 87 percent of the species in the study. These findings resonate with other hunting studies that I have conducted over the years on Borneo. First, our Borneo-wide interview surveys conducted in 2009 suggested that thousands of orangutans are killed every year. More than half of the killings resulted in the orangutan being turned into a tasty steak or orangutan stew. 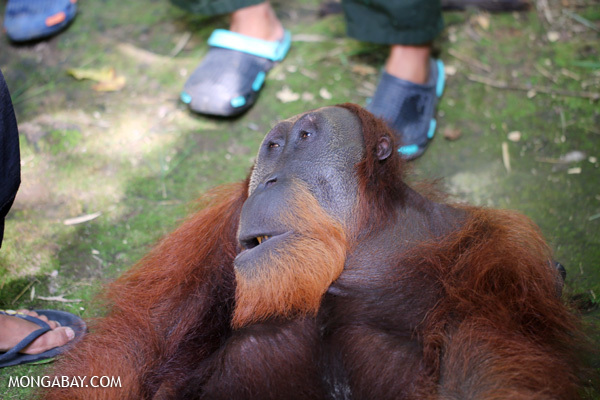 The killing of orangutans happens both deep inside forests and in areas that are being deforested. Especially in areas where orangutans co-occurred with nomadic hunting tribes, the orangutan went extinct ages ago. So for orangutans, the picture that hunting is a bigger threat than logging seems well supported. To get a better idea of the number of animals that are commonly affected through hunting, I conducted another study a few years ago. Every month for one year we gave 18 households in a Dayak village in East Kalimantan a calendar on which they could mark – with stickers – the different types of animals they had caught. After one year this amounted to 3,289 animals with a combined weight of 21,125 kg. The majority were bearded pigs (81 percent of total weight), deer (8 percent) and fish (6 percent). That’s about half a kilo of wildlife or fish per head of the population per day. Now the total amount is a pretty meaningless number. What really matters is whether or not the take-off levels are sustainable. That is, can people keep harvesting at this level without species populations going extinct? Problematically, almost no one is studying this. We can, however, get some idea about the answer when we talk to local communities. And their answer is pretty gloomy. Pretty much any species they mention is considered to be in decline. There are fewer pigs, fewer deer, fewer monkeys, fewer orangutans, fewer fish, fewer snakes. Everything is going down. People are concerned about this, because today their meat is a free resource, but when that is gone they will have to start shopping in markets and for that they need cash. But despite their worries, no one is doing anything to change hunting habits. Ever since I started talking to people in Kalimantan in the early 1990s about their hunting habits, I have been rather baffled by the fact that so few conservation-minded people in Indonesia show any interest in the topic, unless it concerns big conservation icons like tiger or rhino. If hunting is indeed such a big conservation problem, why are we not doing anything about it? Part of the explanation is a belief held by many conservation advocates that the ‘traditional’ people of Borneo and other tropical forest areas somehow understand the concept of sustainable hunting levels. Trust me, they don’t. If we want to maintain fish, bird and mammal populations that are big enough to feed people in perpetuity, they will have to change their hunting and fishing habits. Laws about killing and harvesting endangered and commercially valuable species need to be enforced. Zero-hunting zones have to be established where wildlife populations can grow. Similar no-fishing zones have proven to be very effective, if indeed enforced rigorously. And importantly, as long as wildlife is considered a resource owned by everyone, the ‘tragedy of the commons’ will apply: no one will bother to manage the resource because nobody feels ownership or responsibility. The empty forest syndrome – standing trees without wildlife – is staring Indonesia into the face in pretty much all forests. Which conservation organizations and government authorities have the guts to stand up and do something about it? Erik Meijaard is a Jakarta-based conservation scientist. A slain black rhino mom and her orphan calf. Will the Rhino survive us? This weekend I spent a few days in the lowfeld near Phalaborwa. As many other National parks in South Africa, the Kruger is also suffering from poaching. When I entered the gate the rangers ask you two questions. Do you have alcohol? Do you have guns? They check the car booth but any criminal will be able to smuggle in fire arms. This way of checking for guns is definitely not effective. I did not see a Rhino. During the 400 km’s through the Kruger National park I did not see one! Only in the Kruger park in 2013 300 Rhinos have been shot for their horn. 24/7 rangers guards near the Rhino’s Ntombi and Tabo in Thula Thula. Organized criminals use all means to kill this animal. Often with help (information) from locals. And as some people say, the horns sometimes leave the country in diplomatic mail. Poaching Rhino’s is big business. The horn is more valuable per ounce than gold. China and Vietnam are the biggest markets for Rhino horn as they believe the horn is an afrodisiac. Rangers do anything to protect these animals but it is WAR. A full scale war between organised criminals with helicopters and rangers who try to defend the Rhino with their lives. In 2014 already 40 people have been killed in the war against poaching. Some private game parks have 24/7 guards following the Rhino in order to try to prevent these creatures from going extinct. Others inject the horn with poison in order to make it useless for the consumers in the far-east. Some nature conservationists believe in re-location of the Rhino to remote areas where they are safe. Others think concentrating Rhinos is helping the poachers. In some game reserves the Rhino horn is injected with a chip, so that the poached horn can be traced by satellites. Save our Rhino campaign poster. A marketing campaign in China and Vietnam is also considered by some organizations. However , huge budgets are needed for campaigns like that. At the turn of the 19th century there were more than 1.000.000 (million) Rhino’s. In 2007 1 Rhino was poached every month. As you can see at the attached pics the numbers of poached Rhino went up year by year. In 2013 89 (Eighty nine) Rhino’s were poached each month. When poaching continues in this rate, in my life time, we will not be able to see this creature anymore. We, humans kill one of the last dinosaurs. Is there any hope for the Rhino? At the turn of the 19th century, there were approximately one million rhinos. In 1970, there were around 70,000. Today, there are only around 28,000 rhinos surviving in the wild.Three of the five species of rhino are “Critically Endangered” as defined by theIUCN (World Conservation Union). A taxon is classified as critically endangered when the best available evidence indicates that it meets any of a range of pre-determined criteria. It is therefore considered to be facing an extremely high risk of extinction in the wild. The Southern subspecies of the white rhino is classified by theIUCN in the lesser category of being “Near Threatened”; and the Greater one-horned rhino is classified as “Vulnerable”; even this is considered to be facing a high risk of extinction in the wild.In 2014, some of us are lucky enough to be able to travel to Africa and Asia to see them in the wild. In 2024, when our children have grown up, will they still be able to see wild rhinos? Poachers kill rhinos for the price they can get for the horns (used for traditional Chinese medicine, for high-status gifts in Vietnam and for quack cures invented by criminal syndicates to drive up demand); land encroachment, illegal logging and pollution are destroying their habitat; and political conflicts adversely affect conservation programmes. We know that conservation efforts save species. The Southern white rhino would not exist today if it were not for the work of a few determined people, who brought together the 200 or so individuals surviving, for a managed breeding and re-introduction programme. Today, there are some 20,405 (as at 31 Dec. 2012) Southern white rhinos.With more money, we can support more programmes, and not just save rhino populations, but increase numbers and develop populations. The Northern white rhino subspecies may just have become extinct, but it is not too late to save the rest. We all have an opportunity to get involved! You can help us raise awareness of the plight of the rhino! The more we do all together, the more people will learn about rhinos and the more field projects we will be able to support. There are lots of fundraising ideas scattered in the ‘Support us’ section, as well as ways to donate directly to Save the Rhino. Ntombi and Tabo, two orphins in Thula Thula, now 5 years old.